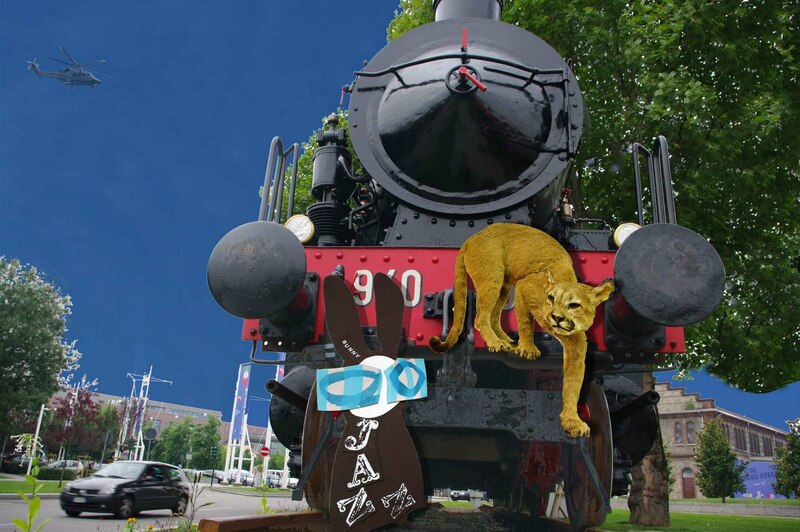 The Wabbit spotted Puma getting down from a Big Steam Train and he hopped up very quickly to find out what was happening. "Hello Wabbit," said Puma, "I have arranged my lift to Rome." "This train doesn't go anywhere," said the Wabbit. "You're quite mistaken," said the train. "The train is taking 500 children with special needs on a surprise trip to Rome," said Puma. "What's your name?" said the Wabbit to the train. "I am Gr 940-330," the train replied. "I'll never remember that," said the Wabbit, "do you have a nickname?" "I call her Thunder," said Puma. The Wabbit thought that was a much better name than a row of numbers and he nodded his head in agreement. "Puma, please stay in the cabin. Don't prowl the train, frightening the children," he said. "I am detailed to provide entertainment," said Puma. The Wabbit looked questioningly. "Together with the children I will look out the window and count things," said Puma. "Like telegraph poles?" asked the Wabbit. "Especially the ones with numbers, and then we will all calculate our average speed and there will be a prize," said Puma gravely. "A prize?" said the Wabbit. "A signed copy of our book on release," said Puma. "What a good idea," said the Wabbit, "and educational too." He deftly signed several imaginary copies of their book and grinned. "Thunder, will you set Puma down at the Stazione di Roma San Pietro?" he asked. "Now, that's what I call a railway station!" said Thunder.